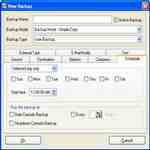 There are several goodÂ freewareÂ backup software that you can use to backup your business or personal files. There is a free backup utility that comes with Windows XP and Vista. We don’t generally recommend it, because the feature set is pretty basic, and not all features are available in all versions of Windows. So let’s look at a couple of free downloadable backup solutions. One option that you have is FileFort Backup Software. This one Â works with the Windows operating system and can be used to backup both your PC and your Windows CE devices. This software is fully functional, safe and completely free. It is also very easy to use as it walks you through the set up process via a set up wizard. FileFort allows you to automatically backup your data to any location like :on your hard drive, network, a FTP site or to the portable media storage device like a CD or DVD. Another good choice is Comodo Backup. If you are familiar with the Comodo name then you know that this software manufacturer has a good reputation. 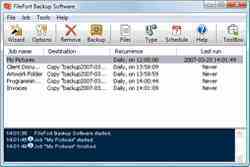 Comodo Backup works with Windows XP, Vista and 2000. It requires a 233 MHz or faster processor, 128 MB of RAM and at least 12MB of free hard drive space. It will allow you to backup your files and store them in a file on your hard drive, a portable storage device or on a FTP site. This program also allows you to schedule your backups and compress your ZIP files to save disk space. Posted in	System utilities. Tagged with	Backup Solutions, Backups, Disk Space, Feature Set, Free Backup Software, Free Backup Utility, Free Hard Drive, Free Hard Drive Space, free software, Freeware, Freeware Backup, Freeware Software, freeware tips and tweaks for win xp, freewaretips, freewaretips.info, Good Reputation, hard drive data recovery, hard drive media freeware, Media Storage, network storage, Personal Files, personal injury attorney, personal injury attorney los angeles, Portable Storage Device, Software Manufacturer, That Comes With Windows, web, Windows Operating System, Windows Xp, Wizard.